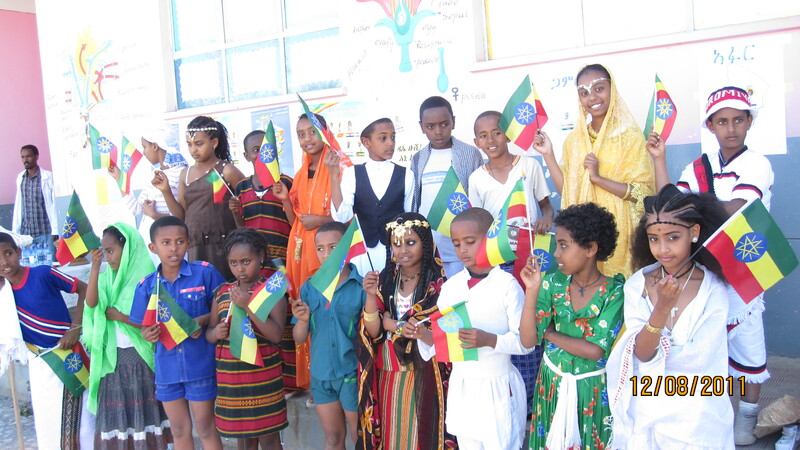 Students from Simret Merha Tibeb Academy celebrated Ethiopian Nation and Nationalities Day at its eve in their school compound. The students dressed in traditional attire, colorfully representing the different ethnics groups of Ethiopia. During the celebration, the students presented an anthem called “Our Diversity is Our Beauty” and it was respectfully received by the audience. The anthem is well known throughout Ethiopia having often been presented on mainstream media. The children were well prepared for their presentation through dedicated training and rehearsals prior to the celebration provided by their teachers and school administration. On the eve of the National Day of Nation and Nationalities of Ethiopia, the students presented different shows that made the day more joyful. They presented poems, traditional songs, martial arts and exhibitions that expressed the walks of life of many different Ethiopian ethnicities. W/ro Feven Mengisteab, managing director of the Simret Merha Tibeb Academy and the school teachers together with the students broke ‘Hambasha’ the Tigriyan bread in honor of the day. Parents and guests throughout the community and local government officials were among the audience. Simret Merha Tibeb Academy is a well-respected private school in Tigray region.